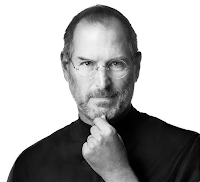 It was with sadness that I learned today of the death of Steve Jobs. Although I never met him, he had a big influence on my life. My interest in computers began the day my father brought an Apple II+ home with him. Dad had the foresight to see that computers would soon be an vital part of modern life, and he felt it important that we have one in our home. That first Apple computer in the back room of my childhood home was the spark that ignited my lifelong interest in computers—an interest that would later become a career. I worked at Apple while attending university. Later at IBM, I anointed myself unofficial chief Mac evangelist of the company, patiently overcoming bureaucracy and prejudice to make Big Blue a more Mac-friendly workplace. There are Apple connections in my family too. Shortly after I left Apple, my brother started there. He and his wife now work at the company’s Cupertino headquarters. Without Steve Jobs, my life would have been very different. From his parents’ garage, Steve started a company that would one day become the world’s largest. Steve imbued everything he worked on with a special philosophy. You can see it in everything from how the Apple designs its products to the way the company treats its employees. You can also see it in the touching stories from the creative team at Pixar. These companies owe their success to Steve’s vision and passion. Steve went before his time, but damn if he didn’t get a lot done in his life! He truly made the world a better and more beautiful place.